…We have already wasted too much precious diplomatic and political capital on the Iran situation. The free world needs the undivided attention of its leader, so now let’s move on! I am glad that we finally have an ‘agreement’ with Iran over its nuclear enrichment program – not because I particularly like the agreement, nor because I believe that it is the definitive end to Iran’s nuclear ambitions, but the United States – and its allies – have spent a decade and a half obsessing over ways to stop Iran from developing nuclear weapons. Between Iran and the wars in the Middle East – Iraq and Afghanistan – we have spent untold amounts of diplomatic and political capital and our nation’s attention has been completely diverted from other pressing demands in Europe, South America and Asia. Now that we have an agreement, the U.S. can turn its attention to dealing with other pressing issues. We can never totally prevent Iran, or any nation, from developing nuclear weapons if they really want to. Even if we militarily defeat and occupy a nation, we can never be sure that nuclear weapons are not secretly in development. And a sovereign state has numerous ways to hide nuclear arms development. In sum, we simply cannot permanently prevent the development of nuclear weapons by any nation. Look at North Korea. The United States and its allies have tried for over 60 years to reign in the hermit kingdom, but since the early 1990’s North Korea, first secretly, then openly in defiance of international agreements, developed nuclear weapons. As a result of the lack of a verifiable peace agreement with North Korea, the U.S. currently supports more than 28,000 American service members in defending the Republic of Korea (South Korea) against the so-called “Democratic Republic of North Korea.” In addition, the Seventh U.S. Air Force, the III Marine Expeditionary Force and numerous other U.S. military formations are targeted toward defending South Korea. Those forces could have been, and could be, used to project and protect U.S. and its allies’ democratic interests in numerous other world arenas. We can, and should, argue about the details and effectiveness of the agreement with Iran, but in the long run, our greatest defense is our offense: let Iran, and any other competitor nation, know that if diplomacy fails the U.S. retains the right to use its military forces – including its nukes when appropriate – to protect its interests worldwide. Of course we should always try to use diplomacy to peacefully resolve any hostile situation, but if Iran, or any other nation tries to use nuclear weapons or other weapons of mass destruction, we must make clear that a war will begin that will result in the defeat – if not annihilation – of the aggressor. We have already wasted too much precious diplomatic and political capital on the Iran situation. The free world needs the undivided attention of its leader, so now let’s move on! 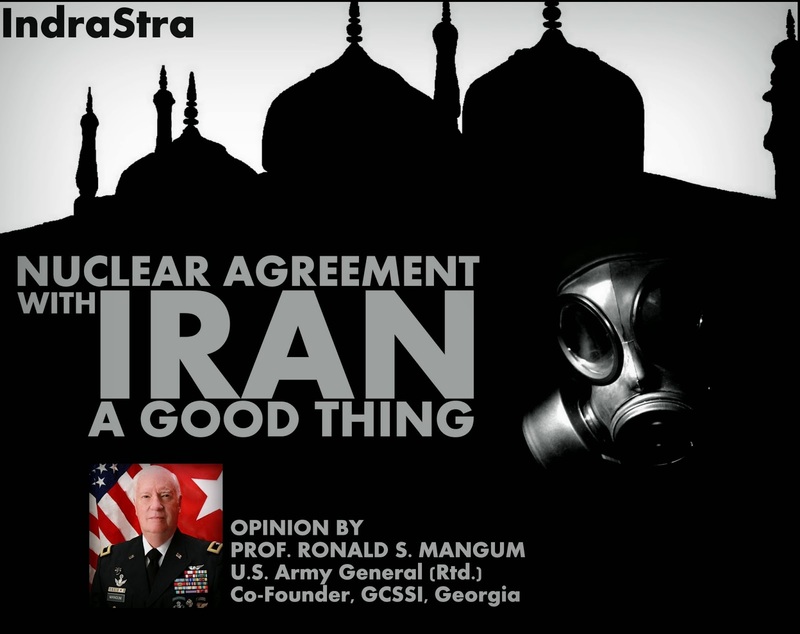 Ronald S. Mangum is Professor of National Security Studies at American Military University and a retired U.S. Army Special Operations Brigadier General. He is also co-founder and rector of the Georgia-Caucasus Strategic Studies Institute, Tbilisi, Georgia, and founder and President of Defense Consultancy, Inc., U.S.A.